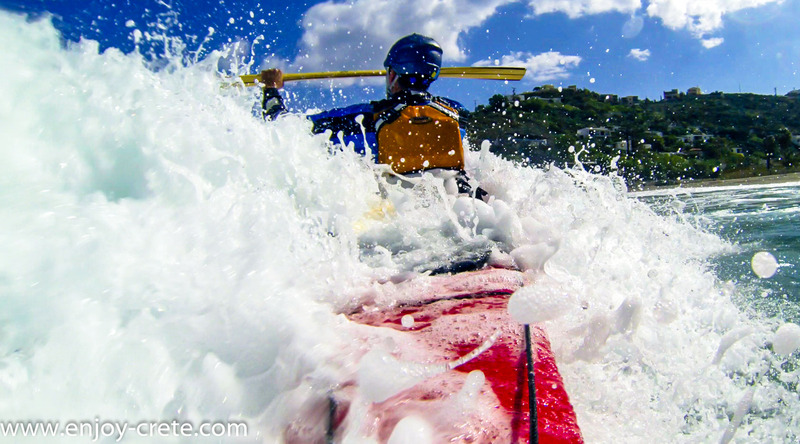 This sea kayak expedition is available only during winter months; from mid November to late March. 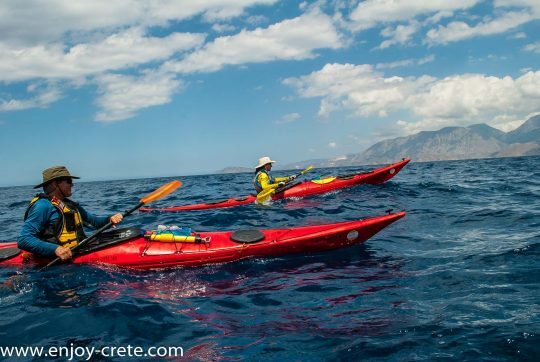 The expedition is for strong and competent paddlers (you need to be at 4* level) who would like to enjoy the experience of an extended sea trip and rough water. 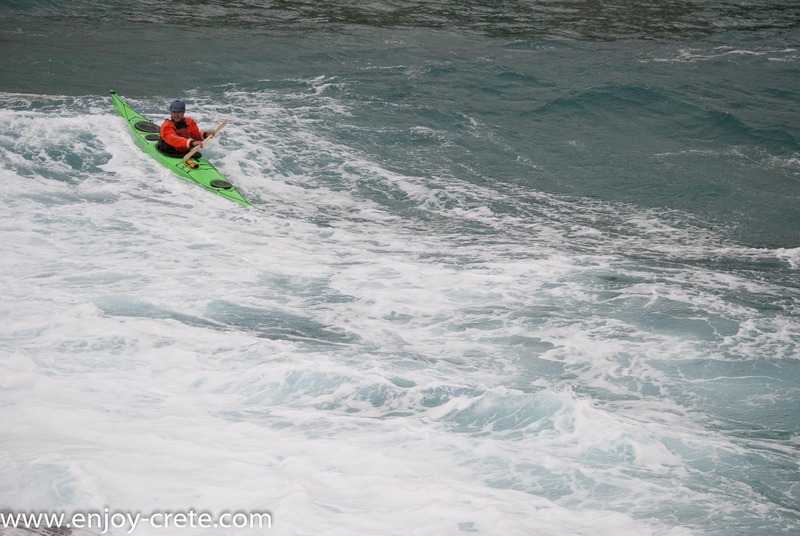 Dry suit is not needed as with a cag and a neoprene short or trouser you will be fine. Most of the times the ground temperature doesn’t go lower than 10-14oC while plenty of days with sunshine and near 18-20oC. The trip starts near Chania town in north West and weather wise will finish near Agios Nikolaos or Pachia Ammos village in eastern Crete. 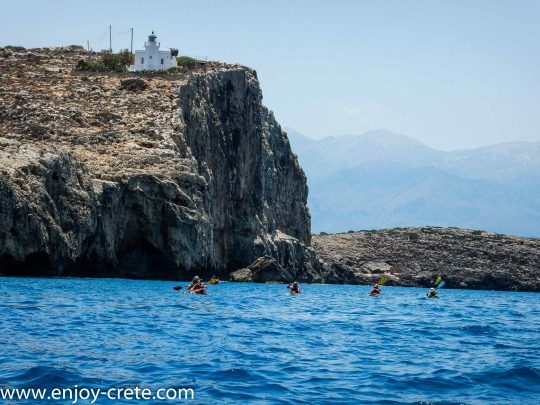 It is a lovely trip and the winter season is offering a unique view to the snow capped mountains of Crete. The island is extremely quiet during the winter thus offering some great camping spots which are impossible to camp during the summer. The whole expedition is about 220km. This equates to about 22km/day in 10 days. Bad weather days plus the first and last day (limited paddling due to driving distance) will make it necessary to increase the daily kilometres up to 35 or more. 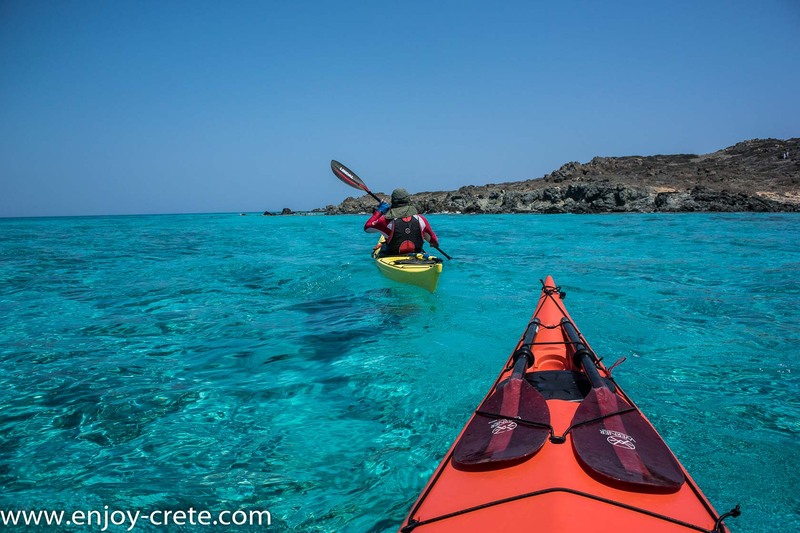 A great expedition if you have already done the West Crete trip. We will buy 4 days worth of food and water for 2 days at the beginning as we will be able to restock during the route. Our guide will give you a detailed briefing and sort out if there is any issue related with food or camping. Meals in seaside towns, or beach side taverna's, are not possible apart from maybe a day or two due to been all closed for the winter season. 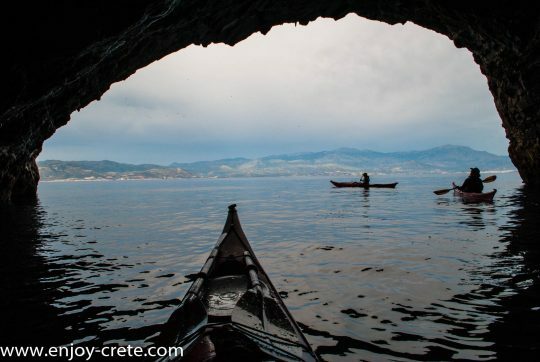 The island is extremely quiet during the winter which takes place this expedition, it is simply wonderful. 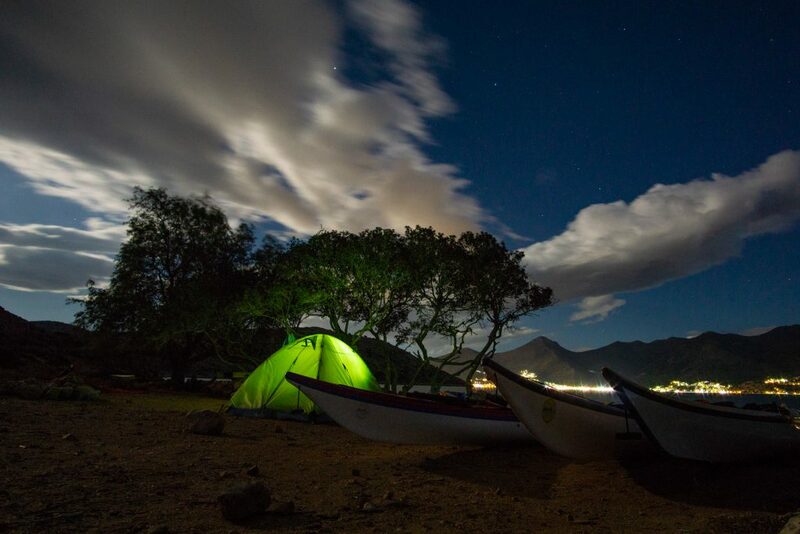 For camping you need to have with you pegs suitable for both sandy and rocky beaches. We will meet near the city of Heraklion between 8-9 am. You should arrive in Heraklion the day before. Your flight needs to be late enough as we need about 2 hours to get there from the place that will finish our sea kayak trip. An alternative airport if you do find a much cheaper flight is the one in Chania. You can click the link below to have a quick search about the flights. Will I be able to leave my suitcase with you? Ideally try to have all your stuff for the trip inside multiple and small dry bags and those inside a suitcase or any other rucksack. It is important to have your stuff in either rucksack or suitcase as usually we have very limited space inside the car and need to carry all passengers stuff in the roof rack with straps. The driver can store afterwards your suitcase or rucksack in our warehouse and bring it back to you once the trip finish. Of course if you are staying in a hotel prior and after the trip you can ask them to store your stuff there if you prefer. How is the weather usually in this expedition? As this trip is available only during the winter months the ground temperature varies from 8oC to 20oC while the water at 15-18oC. It is extremely unlikely not to have sunshine during a day. Might be raining for a couple of hours but usually sun is coming up at some point. Can I rent all camping equipment? We can provide all the equipment for camping apart from sleeping bag for an extra cost. You can get a high quality 3 or 4 season tent for an extra 30€ for the whole duration of the trip and with an extra 10€ an inflatable mattress or a normal mattress if inflatables are already booked. Stove and gas canister are included in the price of the trip. Be sure that your tent is waterproof as when it rains, it rains a lot! How can I pay to book/confirm the trip? Please fill the booking form located on the top of the page as it has extra information that we need. Once you fill the booking form we will let you know within 1-2 days about the availability and will send you a link where you can pay the 20% of the total price to confirm booking. You can pay us the rest of the money either in cash or with your credit card two days before the starting date as we need to have the funds cleared before the trip. What to bring for the trip? Everything you carry on a summer expedition in the north if you are coming from a north country apart from dry suit. A swimming suit is wise to bring as some days are warm enough for paddlers from northern countries to have a swim. 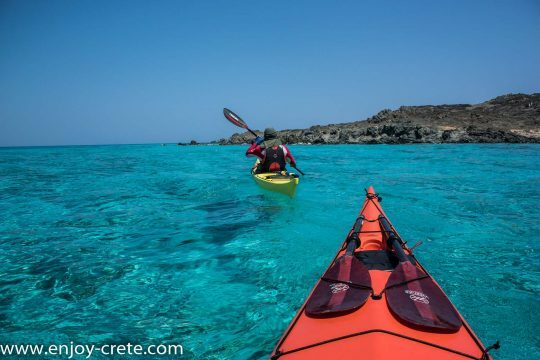 A typical winter in Crete is like a very good summer in the UK to get roughly an idea.